In this episode, the girls revisit past finished objects. Danie ends her FO drought, and Susie recovers her mojo. Danie ended her FO drought by finishing her 60 Stitch Skyp Socks. Susie started her Atlantic Current Socks, and finished the first one already. She is using the gusset from the Basic Sock with a Double Gusset Heel and adores it. Danie worked a bit on her Awesome Socks. Danie reconsidered her Dude Socks, and has decided to keep husband socks simple. Danie discovered a new-to-her video podcast, Sockmatician, and she enjoys everything about it. Check it out! In this episode, the girls natter about needle storage. Danie has fancy new glasses, and Susie has a bit of a periodic general funk. The winner of the skein of yarn from One Twisted Tree was announced! 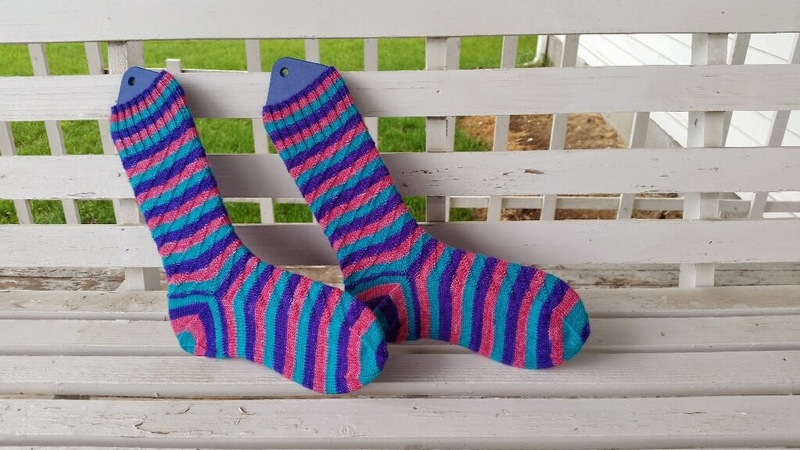 Susie finished her Swirl E. Socks! The stripes match up very well, except for the color order on the heels. She decided the recipient could live with it rather than frogging. Susie picked back up her Dragonflies Jumper, and cast on a new pair of husband socks. Danie worked on her 60 Stitch Skyp Socks, as well as her Awesome Socks. Danie worked just a little on her Dude Socks, got the heels knit in both of her 60 Stitch Skyp Socks, and started a new pair of Awesome Socks out of Kirbywirby yarn. She had a son of a stitch with herMama Vertebrae in the form of a dropped stitch she has decided to tack down rather than tink back to fix. Susie plans on casting on the third curl, Gridelin, possibly out of Knit Picks Wool of the Andes Sport in Baltic Heather, leftover from her Holloway. She also wants to cast on a pair of Atlantic Current Socks using Lorna’s Laces Solemate in Blue Skies Over Colorado. In this episode, the girls hide Easter eggs and give progress reports on their 2015 knitting plans. 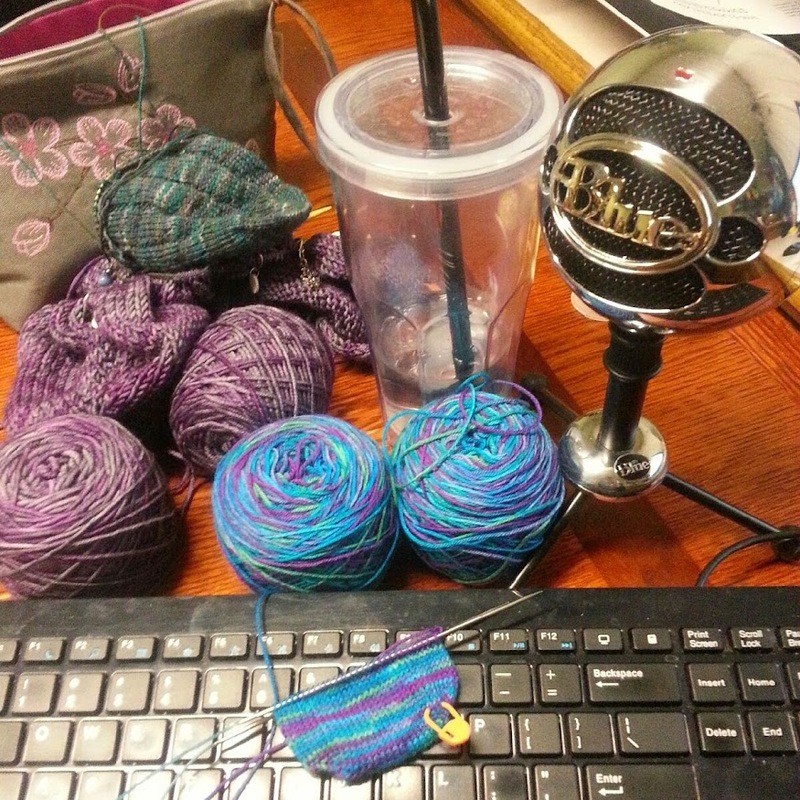 Susie remembers to bring her knitting to record a knitting podcast, and Danie searches for a sock pattern. Miscellaneous mentions include Knitting Vintage Socks, Atlantic Current Socks, Lo-Lo bars, and Chromecast. Susie finished the first of the pair of Swirl E. Socks, added the second skein of yarn to her Bonnie’s Wish, and added a few more squares to her scrap blanket. 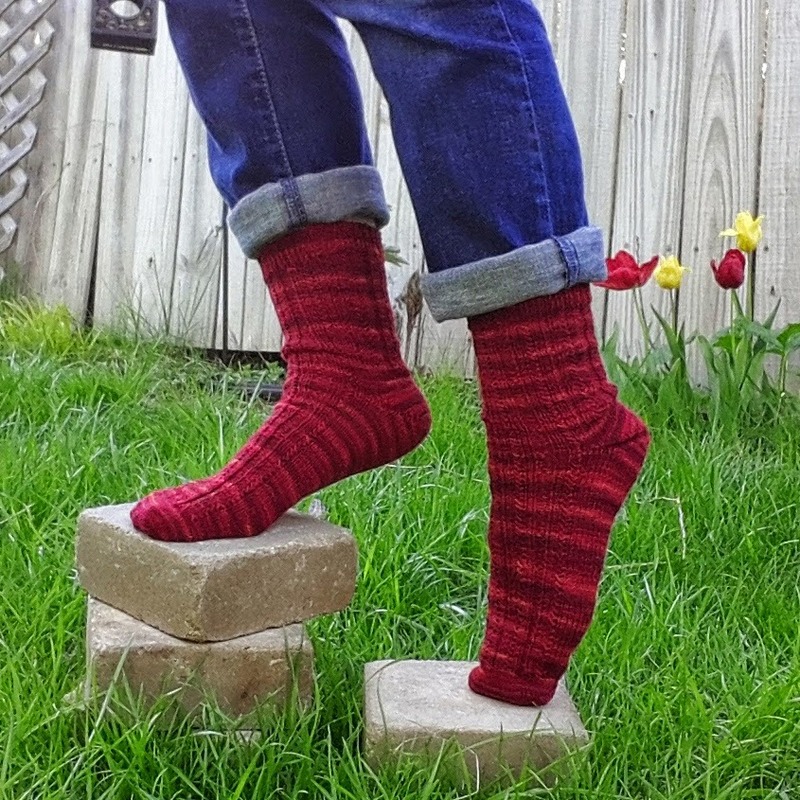 Danie worked just a little on her Dude Socks, got the heels knit in both of her 60 Stitch Skyp Socks, and started a new pair of Awesome Socks out of Kirbywirby yarn. She had a son of a stitch with her Mama Vertebrae in the form of a dropped stitch she has decided to tack down rather than tink back to fix.